I was very excited to read this book. I had heard really great things about it. And how could I resist a book where teens get to hang out on the Vegas strip? I've never been to Vegas so I really wanted to see it through their eyes. After thinking on the rating for a long time, I've decided that it's probably a 2.5-3.0, but I can't really put my finger on it, so I'll just leave it at a 3. The book is written in four points of view: Savannah, Courtney, Peyton and Madison. I liked seeing how each character experienced their surroundings differently. Savannah, being the youngest, was of course more naive than the others. She had ideals of her newly rich life in Vegas and wants to take full advantage of it. Some of her choices are not really all that smart, but she does learn from them and grow. Courtney, the most level headed of the group, just wants to keep on doing what she's always done, studied and worked and not worried about anything else. She's unhappy with being in Vegas and tries to stay away from the chaotic life she's been tossed into. But of course it's hard to keep to yourself and not get lured into the bright lights. And she slowly finds her niche. Peyton, the oldest of the sisters, is just a mad sort of girl. Everything makes her angry and she wants to rebel against anything that's thrown her way. Not to mention she doesn't want to get tied down to anything. I found her to have the least growth in the book. Madison is their nemesis. She's upset that the Diamond sisters have been thrust into her world and have upset her perfect life. Or what she's come to know as her perfect life. The changes are making her angry and she wants things to go back to the way they were. What struck me as most unsettling in this book was the way alcohol was thrown around. Honestly, since I've never been to Vegas, I don't know if it's all that easy for teens to drink the way the teens did in this book. But I would imagine it's more strict since the livelihood of that city highly depends on such things. However, I kind of see where the author was taking this, with rich kids being able to skirt the laws and have people turn the other cheek because of who they are and who they are connected to. Also, there is a lot of promiscuity from the youngest sister. This was a bit upsetting to me. She's only 15 but she jumps right into the waiting arms of a guy she hardly knows. The insta-attraction didn't sit well with me, even though I could see a young girl having such an obsession. There is an underlying theme that's never revealed in the book: who exactly is Adrian Diamond and why is it he never wanted his children to be part of his life in Vegas. I can only imagine it may have to do with illegal dealings and the people who would like to see him pushed out so they can rise to the top where he is. I expect we will see more of that in the second book, so I am looking forward to that theme. The book is written in third person. This made it really hard for me to connect with the characters. I felt like since it was in so many different points of view it certainly would have been easier to understand the motivations of the characters if we were inside their heads. I didn't find the girls realistic in their thought processes and their actions. Courtney was the most realistic and down to earth character in my opinion. I also had a hard time seeing the attraction of any of the boys in this book. Most of them struck me as arrogant and I didn't see how this was attractive to any of the girls. Overall this story was just ok for me. I honestly felt like not all that much happened from the beginning to the end. It seemed to be a book of world building, where we really are just brought into the lifestyle of the rich and famous of Vegas. I'm not sure if it's setting the foundation for things to come, but I feel like there could have been more tension and more action to have kept the book more intriguing. The ending did set it up for me to want to know what happens, so I will read the next book in the hopes that my curiosity is settled. Michelle Madow wrote her first novel, Remembrance, in her junior year of college. Remembrance is the first book in The Transcend Time Saga, a three part series about reincarnation and true love. The series was inspired by Taylor Swift's "Love Story" music video. 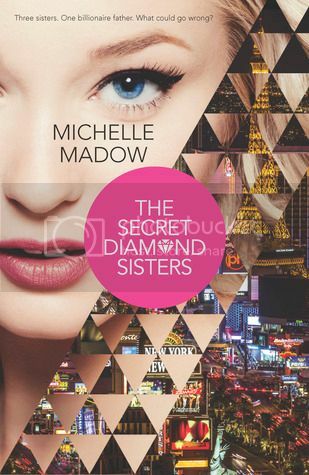 Michelle's latest YA novel, The Secret Diamond Sisters, about three sisters who discover they are the secret heirs to a Las Vegas billionaire casino owner, was published in March 2014. It is the first in an upcoming trilogy. The second part, Diamonds in the Rough, will be coming out in November 2014. Michelle lives in Boca Raton, Florida, where she is writing more novels for young adults. She loves reading, spending time with family and friends, traveling, shopping, sunshine, Disney fairy tales, Broadway musicals, and spends way too much time on Facebook (/MichelleMadow) and Twitter (@MichelleMadow). To chat with Michelle and other fans about her books, join Michelle Madow's Street Team on Facebook! She's very active in the group and would love to hear from you! Haha omg you and I are on the same page, I reviewed book two, Diamonds in the Rough, today (Sunday)! But I'm sorry to see that you didn't enjoy this book more. I know the multiple perspectives in third person is hit or miss for readers. I liked it, but then, in general, I really like third person. I see what you're saying about the alcohol thing though, for sure! Thanks Alyssa. I have book 2 for review, as well. I hope I like it more. We shall see.